Our Tea Tree Essential Oil is from non-gmo farms and it is Kosher certified. Herbal Folk Traditional uses for Tea Tree Essential Oil is a long list of applications because of its effectiveness against bacteria, fungus and viruses. Tea Tree Essential Oil is known for its antiseptic, anti-histamine, anti-inflammatory and immune stimulating properties. It has a warm, fresh, spicy camphoraceous scent. Tea Tree Essential Oil blends well with Clary Sage, Clove, Geranium, Lavender, Marjoram, Nutmeg, Oakmoss, Pine, Rosemary and Ylang Ylang. 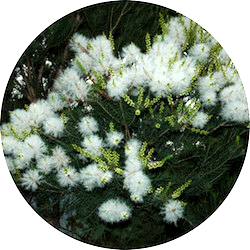 Tea Tree Essential Oil is steam distilled from the leaves. Tea Tree Essential Oil has the following actions: anti-infectious, antibacterial, anti-fungal, anti-inflammatory, antimicrobial, anti-parasitic, antiseptic, antiviral, balsamic, cicatrizant, diaphoretic, expectorant, immune stimulant, and vulnerary. Our beautiful picture of the Tea Tree was taken by Vanessa Fire and is used with her permission. Shelf life is 3 years or more. Tea Tree has so many uses! I've had fast results when using this oil to get rid of occasional acne like when I eat an offending food, hives, fungus on a fingernail and even for slow healing wounds. Tea Tree essential oil is the best small price for a great immune system booster for all of these types of ailments.